Is Kyndall going to be a Season 4 cast member? This woman has been a main topic of conversation for many episodes this season. So of course Andy Cohen asked Monique about her when she appeared on Watch What Happens Live Sunday night. And then they jumped back into the Housewife drama. Andy asked, “Monique, you were the new girl last season. 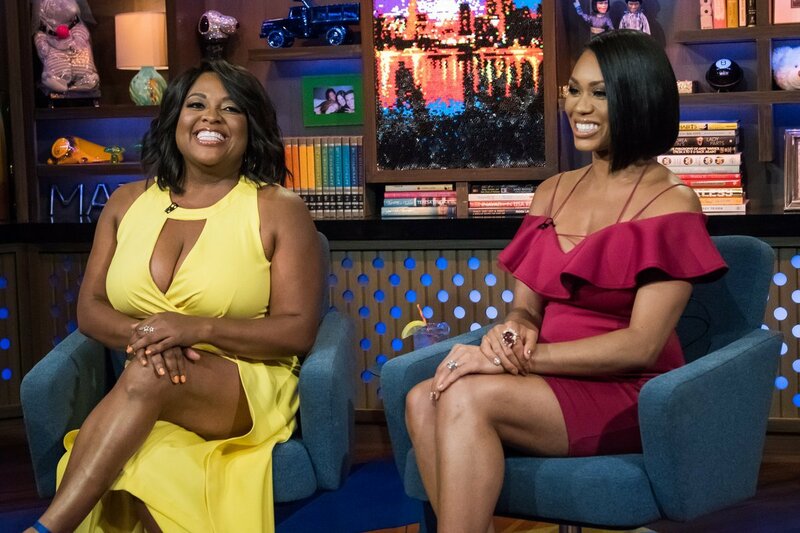 Do you feel like the girls are giving [Candiace Dillard] a chance?” Monique admitted, “I definitely feel like she’s having a little bit of a harder time to earn her respect and her voice.” For the most part, this cast is not picking up what Candiace is laying down? Will she get a shot at a second season? Or will she be a one and done? Speaking of Karen, Monique had some concerns about Karen’s fundraiser to benefit Alzheimer’s Association in a previous episode. In all honesty it just seemed like a very suspect event with Karen initially asking her guests to make out checks to her LLC instead of directly to the charity. Apparently Karen changed her mind about that one since Monique revealed, “That night, I spoke with the director of the association. She was there and she actually gave everyone envelopes to make donations directly to the organization- which we didn’t know going into it. So that night it was already cleared up.” It’s not at-all surprising that this never made the show. It’s a lot more intriguing to just assume that Karen was being shady as hell with that fundraiser than to actually let her redeem herself. A viewer asked Monique, “What did Chris [Samuels] think about the moment you opened up to the girls about the fight that you had?” She admitted, “Oh. You know, he was a little frustrated. He was like ‘Make sure you got the point across. We’re not fighting because I’m needy.’ We were fighting because he wanted me to maintain the same balance that I ask him to maintain when he was coaching.” Fair enough. Even though Monique joined the show as a friend of Charrisse’s, it does not seem like they’re too close these days- especially after this interview. A viewer asked, “What do you think of the rumor about you using Charrisse for her friends and contacts?” Monique answered, “Oh, I think it’s comical. First of all, who have used from her that I’ve benefited at all? I don’t call her people. I have my own. I just feel like that was such a reach and she should have got a step stool.” Shade thrown. TELL US- WHAT DO YOU THINK ABOUT MONIQUE & CHARRISSE INVITING KYNDALL TO EVENTS?